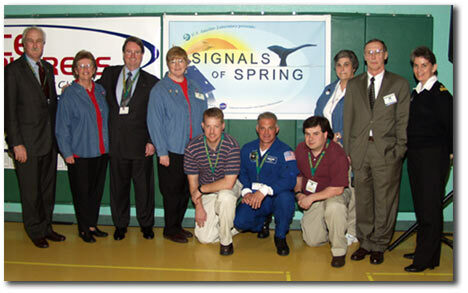 NASA Explorer School, Learning with Signals of Spring, Receives Special Visit! Sixth, seventh and eighth graders at the Chapman School in Sheridan, Oregon, are taking an unusual approach to their Signals of Spring studies—instead of focusing on one animal, they are studying all of them. From monk seals to red-tailed hawks, Chapman students are tracking animals on the move with the guidance of their teachers Tim Hart, Ray Horton and Roxanne Henley. By taking this unique approach, students have the opportunity to compare the different species, for example discussing why one bird species began migrating for the spring, but another is still in its wintering grounds. By studying the gray whale, students have learned the difference between satellite and observational data. According to Mr. Hart, the students have been, “amazingly successful.” Mr. Hart explains that, to the students, “This [program] is real to them; you’ve got them hooked! They are excited.” In just a few months, Chapman students have taken off with the project; they have really seen how environmental processes affect living things, and how humans are interconnected with nature. These students have explored local connections to the animals they are studying, from tracking native species to relating birds to hunting, poaching, wildlife, and agricultural problems. They have made beautiful wall displays and even presented their findings to visitors from NASA including Chief Administrator Sean O'Keefe!